Ever had Afro- Franco-American fusion food before? Me neither, until I went to Farrah Olivia which refers to their cuisine as "Creative American". The best I've heard it described is "Southern American soul food with an African twist". When I first dined at Farrah Olivia, it was Restaurant Week. (Actually, it was the week after Restaurant Week, and the restaurant had expanded their Restaurant Week offering for an additional week.) 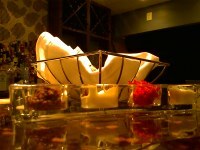 I was surprised at the casual atmosphere, given the pictures of the food that I saw on the Farrah Olivia web site. For some reason I was expecting a Sport-Coats-Required atmosphere, but it was anything but that. The first thing that sticks out when you see the pictures on the web site is the preparation, which is as close to art in food as I've seen. Artful presentation is easily found in the seared scallop appetizer. A scant trail of bacon powder on one side, some bacon bits on the other, then a small pool of the melon seed milk surrounded by a drizzle of the berbere oil. In the center of all that, a single scallop perfectly rare but also perfectly seared with a crispy, caramelized layer on the top and bottom of the scallop. Mixing all of the ingredients together gave a great contrasts in flavor and texture: Creamy and crispy, salty and sweet. This was literally the best scallop I've ever tasted, but the only problem is the price. For $15, you'd think there'd at least be two on the plate?! By far, my favorite dish is so far is the lamb chop I had on my second visit. Like the scallop, there's only a single lamb chop on the dish, and there's probably only about 5 or 6 ounces of meat on the plate, but the texture of the lamb was tender and juicy -- it's been awhile since I let out a moan like that after tasting a dish. A dish that needs no special presentation is the Parmesan soup. The menu says it's silky and it's not kidding -- if you could call something liquid silk, this would be it. Some dishes are creatively presented, but the flavor doesn't quite live up to it. The "shocked" tuna is one example of this. What does "shocked" mean? It means the tuna is dropped in boiling water for a minute then shocked in ice water. The tuna is then sliced in exactly equal potions and ends up looking similar to a seared tuna, but with a much nicer texture, leaving it very similar to sushi. The flavor ended up not being much better than regular old raw tuna though. Another example of this was the Pantagonian Toothfish which was ok, but the white bean puree that was served on the side had an unpleasant chalky taste and texture. I didn't even know what Pantagonian Toothfish was at the time I ordered this dish, but a quick Google search fixed that when I got home. Per Wikipedia, a Pantagonian Toothfish is a large fish found in the cold, temperate waters (from 50 to 3850m) of the Southern Atlantic, Southern Pacific, Indian and Southern Oceans on seamounts and continental shelves around most sub-Antarctic islands. If you're looking for the perfect combination of the key lime pie at Ray's the Steaks (or Classics for that matter) and the cheesecake at Cafe St. Ex, look no further than the lemon cheesecake. And if you've never had either of those desserts, let me give you a little better description. Take a cheesecake with perfect texture, not too dense, but not too creamy, and add the flavor of lemon with just the right amount of sweetness so it's not too tart. This is all on top of a thick graham-cracker crust and topped with a crispy, sweet layer of bruléed sugar. The other desserts are all very good as well, but this one stands out. Farrah Olivia is not a restaurant for the value-centric diner. My average bill for two people with four courses of food and a bottle of wine was about $200. (I never once left feeling hungry, but the portions are small enough that you need to get four courses.) But for those of you that are looking to be challenged by the food you eat and look forward to trying new combinations of flavors, then Farrah Olivia is probably the restaurant for you. On another note, I overheard the manager talking about how she'd just ordered the patio furniture for the summer, which makes me look forward to what new things will be on the menu this summer at Farrah Olivia. Parking: Street and free covered lot. Reservations: Taken and recommended on the weekends although you might be able to walk in and find a seat at the bar if you're lucky. Baby-Child friendly rating: 1 Diaper. I wouldn't be caught dead with my little guy here. February was a good month for ads. We had over $370 come in and March is already off to a good start. So make sure you click on the ads to the right and check out the advertisers' web sites! For March, I'll be giving the ad revenue to Share Our Strength, a national organization dedicated to ending childhood hunger. 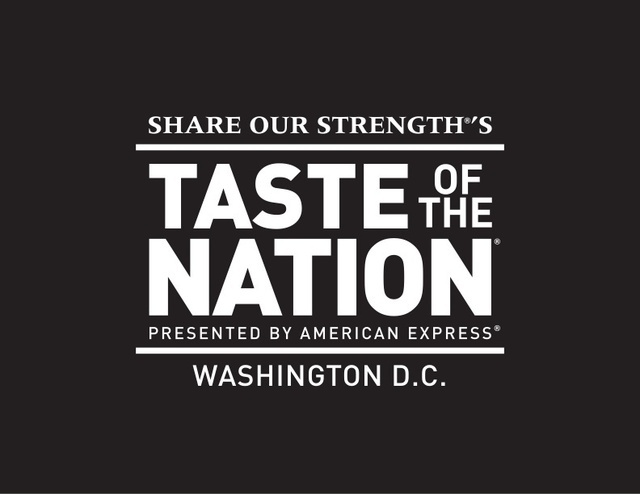 Every year, Share Our Strength organizes an event called Taste of the Nation in major cities across the United States (Washington, D.C.'s event is on April 9th) and this will be the 19th time they've organized the event. Purchasing a ticket to the event gives you an all-access pass to tastings from over 50 of the area's restaurants and chefs, including Equinox, Restaurant Eve, and Cafe Saint Ex. You'll also be able to pair wines from 20 local wineries with the food at the event. Basically, the event is HUGE! Tons of food and wine and 100% of the ticket sales go to fighting hunger in Washington, D.C thanks to all of the sponsors, chefs , and volunteers donating their time and money. 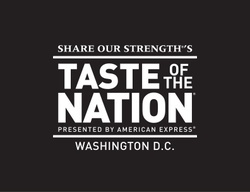 For more information on the event or to buy tickets, check out the Taste of the Nation web site. Or if you just want to make a contribution, go here.